The world’s best golfers are right now competing in the 94th PGA Championship for the final major title of the year on the Ocean Course at Kiawah Island Golf Resort, in South Carolina. As it happens, I have many memorable golf experiences from South Carolina and I’ve had the pleasure of playing the Ocean Course a couple of times. Read my earlier blog post about Stewart Cink and our history at Georgia Tech. It is the first time South Carolina is hosting major championship. The Ocean Course at Kiawah Island Golf Resort has been called one of the toughest courses in America. Needless to say, that all depends on the wind and how the course is set. The back tees are seldom used at the same time (course being 7,676 yards from all the way back), but instead tee setup varies depending on the direction of the wind. Fairways are fairly generous but missing the greens can penalize severely. It will be very exciting to follow this tournament, and especially my friends from the college years. 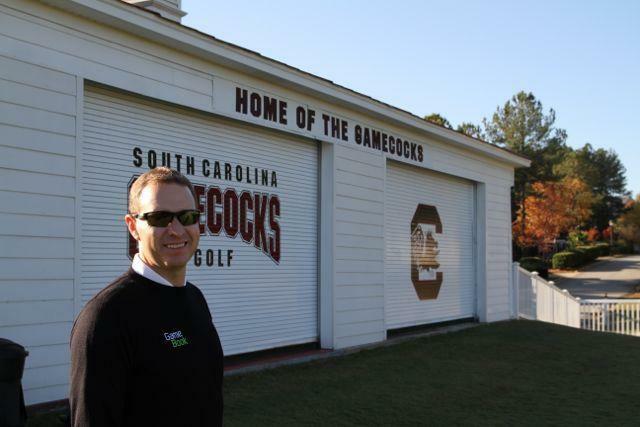 After Stewart Cink and I graduated from Georgia Tech, our coach Puggy Blackmon moved to Columbia (SC) to coach golf teams of the University of South Carolina. He is now the Director of Golf at USC while coaching a few Tour Players… namely David Duval, who also played for Puggy at Georgia Tech same time as I did. Here’s a nice Golf Digest article about Puggy and South Carolina. During my time working for GameBook, I have been fortunate to have chance to visit beautiful Charleston several times, this great old style city with many interesting places to visit. Puggy, much like Stewart Cink, is known to be a super nice guy and obviously a great coach building up the Georgia Tech golf program, and now also at the University of South Carolina. He has helped me out so many times with my playing and practicing, and now years later with Golf GameBook. It was somehow very natural to ask him be one of the amazing advisors that we have on GameBook Team. Advisors have been a great help for me when building networks in the US. Especially in 2008 when we organized the GameBook Pilot in South Carolina to get feedback from players and golf clubs on the early stages of GameBook development. Warm thank you, Puggy & Stewart, for making that a success! Last fall I had an opportunity to catch up again with both Puggy Blackmon and Happ Lathrop (of South Carolina Golf Association). We met at the Cocky Classic, a fundraiser for the USC golf program, where we had the privilege to provide GameBook Live Scoring. Also, it is always nice to visit Bill McDonald, the head coach for the USC men’s team, who also played at Georgia Tech in the late 80s and early 90s. Great golf personalities altogether! Can’t wait to visit again… And this weekend I will go back to South Carolina, to Kiawah, at least in my mind. With all these joyful memories I will follow the PGA Championship very closely. We have great relationship with the South Carolina Golf Association and the key persons there, Happ Lathrop, Biff Lathrop and Chris Miller. They helped us with the Pilot Courses. I am very grateful to them. They know the game so well! Woodlands Country Club was the most active course with super diligent Head Pro Tom Mason. He was helping us a great deal, also after the pilot. Brad Swanson ended up winning the Pilot Grand Prize: round of golf with Stewart Cink himself, a weekend getaway at Chateau Elan Resort, a custom fitted set of Nike Clubs, where Cink advised on the custom fitting part together with Nike rep Shawn Cummins. Brad took his wife Patti and dad Gordon to play together with Cink with mom Yvonne watching ‘within the ropes’. Jody Newman from Strategic Marketing Services was our marketing specialist during the Pilot – great materials and awesome pictures from Bulls Bay! Warren Thomas was a great help supporting the pilot golf clubs and getting feedback from players and dogfights. 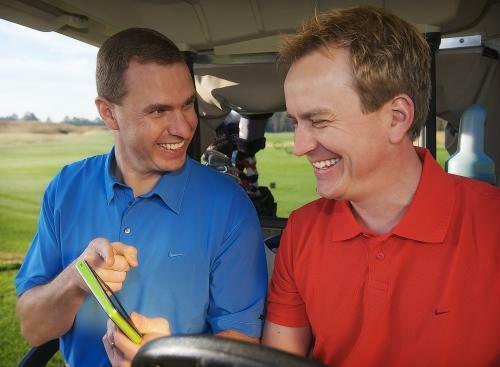 A promo picture from GameBook piloting period, me and Kalle Väinölä having orchestrated fun. We have a series of these, now nostalgic, pictures – those were quite interesting days! Nice memory from the pilot final with the Swansons and Stewart Cink. Wow, Stewart is tall indeed! Me and Tom Mason – he is a great guy!